Why does asteroid 2015 BZ509 orbit the Sun the backwards? As shown in the featured animation, Jupiter’s trojan asteroids orbit the Sun in two major groups — one just ahead of Jupiter, and one just behind — but all orbit the Sun in the same direction as Jupiter. 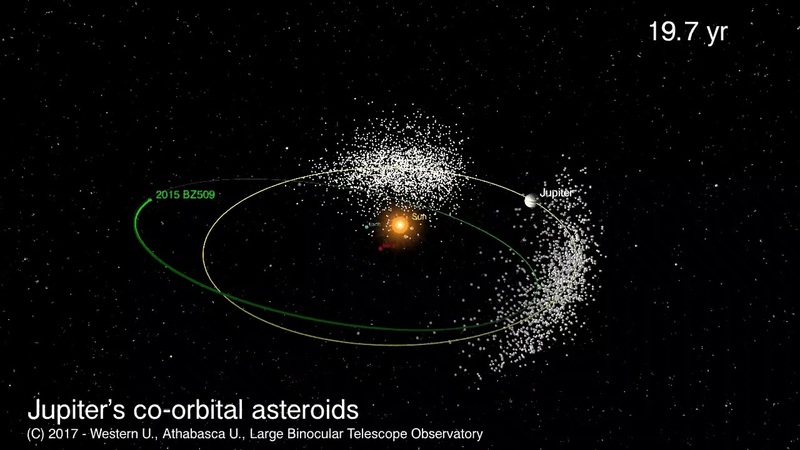 Asteroid BZ509 however, discovered in 2015 and currently unnamed, orbits the Sun in retrograde and in a more complex gravitational dance with Jupiter. The reason why is currently unknown and a topic of research — but if resolved might tell us about the early Solar System. 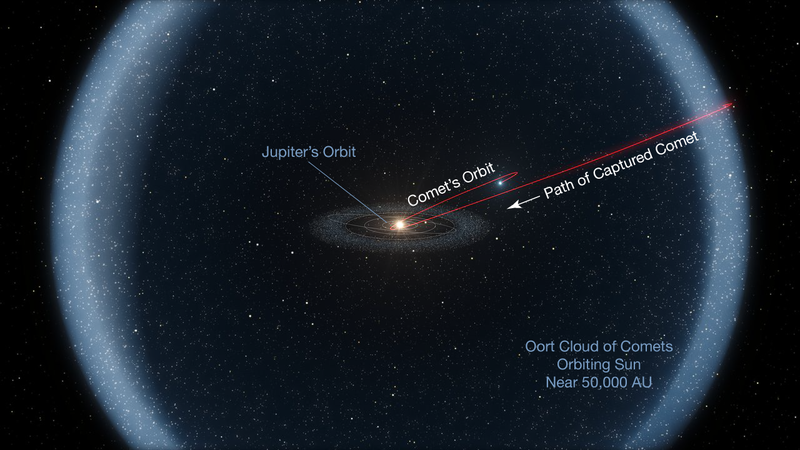 A recently popular hypothesis holds that BZ509 was captured by Jupiter from interstellar space billions of years ago, while a competing conjecture posits that BZ509 came from our Solar System’s own distant Oort cloud of comets, perhaps more recently. The answer may only become known after more detailed models of the likelihood and stability of orbits near Jupiter are studied, or, possibly, by observing direct properties of the unusual object. How many of these can you find in today’s featured photograph: an aurora, airglow, one of the oldest impact craters on the Earth, snow and ice, stars, city lights, and part of the International Space Station? Most of these can be identified by their distinctive colors. The aurora here appears green at the bottom, red at the top, and is visible across the left of image. Airglow appears orange and can be seen hovering over the curve of the Earth. The circular Manicouagan Crater in Canada, about 100 kilometers across and 200 million years old, is visible toward the lower right and is covered in white snow and ice. Stars, light in color, dot the dark background of space. City lights appear a bright yellow and dot the landscape. Finally, across the top, part of the International Space Station (ISS) appears mostly tan. 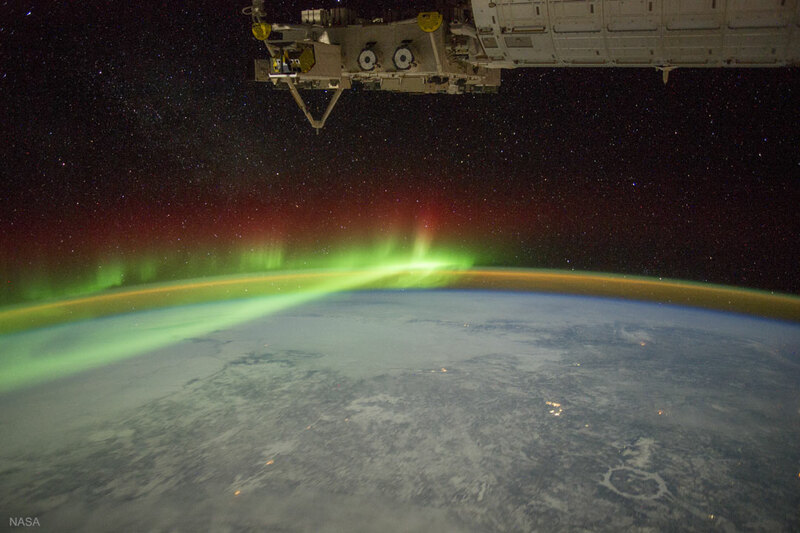 The featured image was taken from the ISS in 2012. Is this really the famous Pleaides star cluster? Known for its iconic blue stars, the Pleaides is shown here in infrared light where the surrounding dust outshines the stars. Here three infrared colors have been mapped into visual colors (R=24, G=12, B=4.6 microns). The base images were taken by NASA’s orbiting Wide Field Infrared Survey Explorer (WISE) spacecraft. 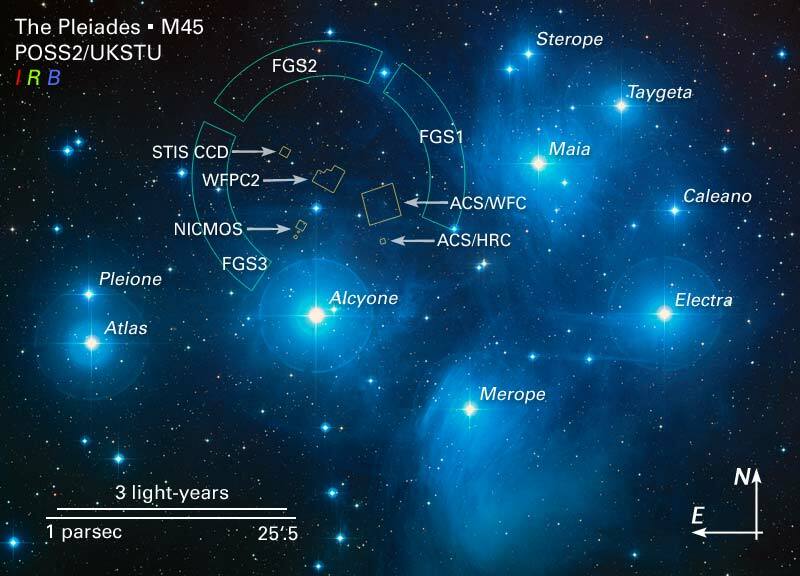 Cataloged as M45 and nicknamed the Seven Sisters, the Pleiades star cluster is by chance situated in a passing dust cloud. 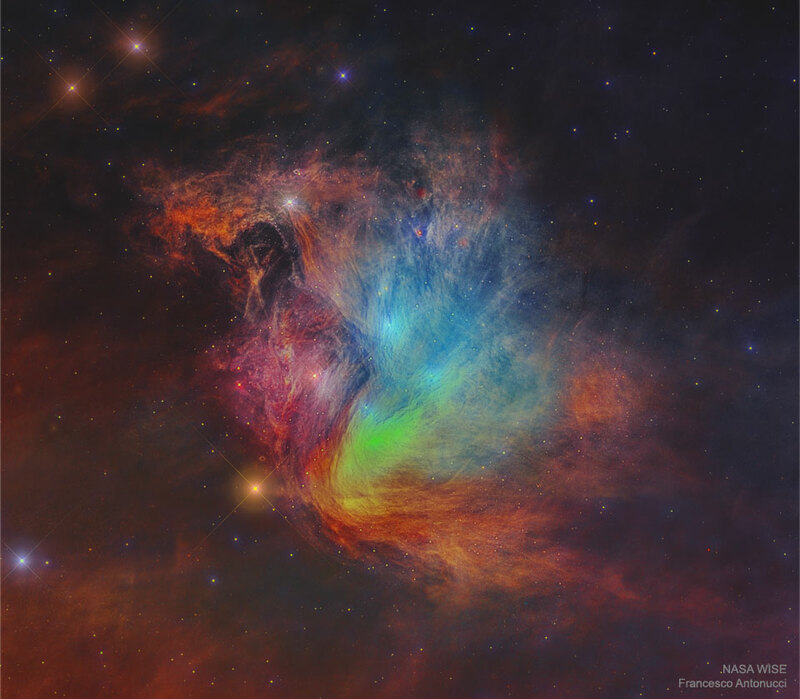 The light and winds from the massive Pleiades stars preferentially repels smaller dust particles, causing the dust to become stratified into filaments, as seen. The featured image spans about 20 light years at the distance of the Pleiades, which lies about 450 light years distant toward the constellation of the Bull (Taurus). Does it rain on the Sun? Yes, although what falls is not water but extremely hot plasma. An example occurred in mid-July 2012 after an eruption on the Sun that produced both a Coronal Mass Ejection and a moderate solar flare. 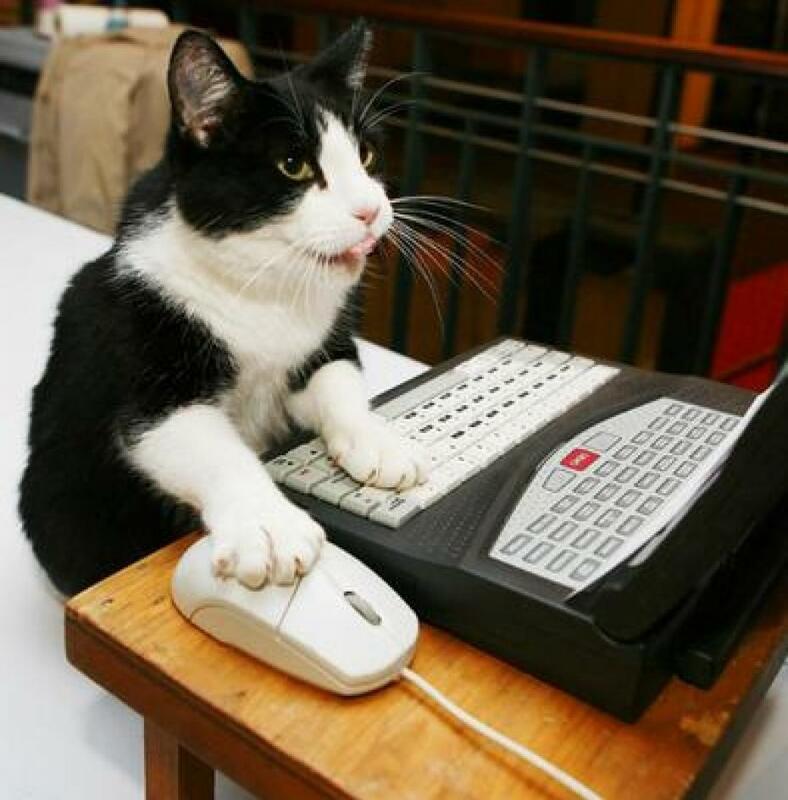 What was more unusual, however, was what happened next. Plasma in the nearby solar corona was imaged cooling and falling back, a phenomenon known as coronal rain. Because they are electrically charged, electrons, protons, and ions in the rain were gracefully channeled along existing magnetic loops near the Sun’s surface, making the scene appear as a surreal three-dimensional sourceless waterfall. The resulting surprisingly-serene spectacle is shown in ultraviolet light and highlights matter glowing at a temperature of about 50,000 Kelvin. Each second in the featured time lapse video takes about 6 minutes in real time, so that the entire coronal rain sequence lasted about 10 hours. Recent observations have confirmed that that coronal rain can also occur in smaller loops for as long as 30 hours. Like Earth’s moon, Saturn’s largest moon Titan is locked in synchronous rotation. 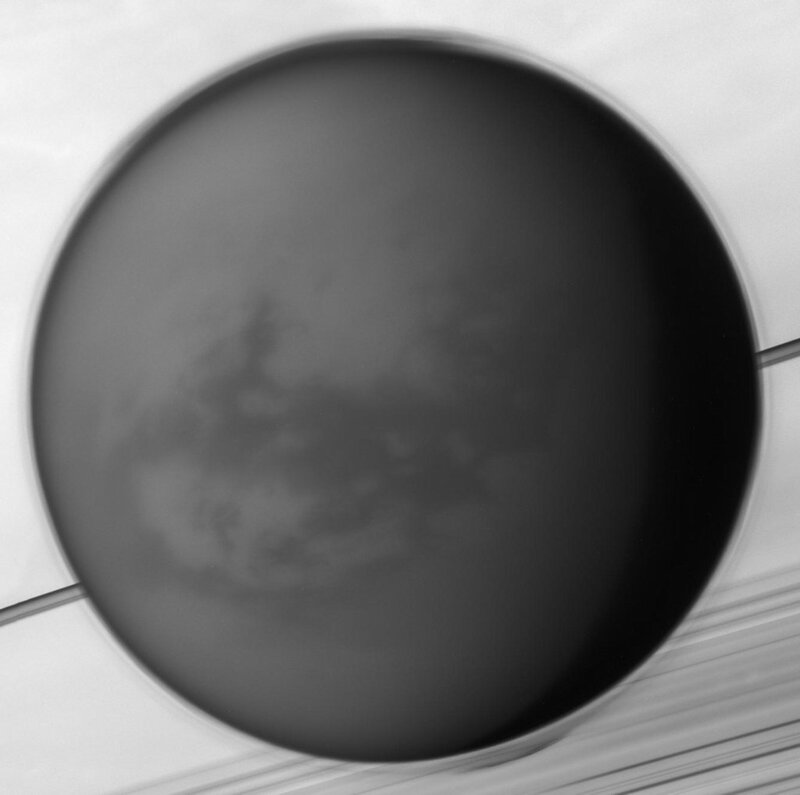 This mosiac of images recorded by the Cassini spacecraft in May of 2012 show’s its anti-Saturn side, the side always facing away from the ringed gas giant. The only moon in the solar system with a dense atmosphere, Titan is the only solar system world besides Earth known to have standing bodies of liquid on its surface and an earthlike cycle of liquid rain and evaporation. Its high altitude layer of atmospheric haze is evident in the Cassini view of the 5,000 kilometer diameter moon over Saturn’s rings and cloud tops. Near center is the dark dune-filled region known as Shangri-La. The Cassini-delivered Huygens probe rests below and left of center, after the most distant landing for a spacecraft from Earth. This stunning group of galaxies is far, far away, about 450 million light-years from planet Earth and cataloged as galaxy cluster Abell S0740. Dominated by the cluster’s large central elliptical galaxy (ESO 325-G004), this reprocessed Hubble Space Telescope view takes in a remarkable assortment of galaxy shapes and sizes with only a few spiky foreground stars scattered through the field. 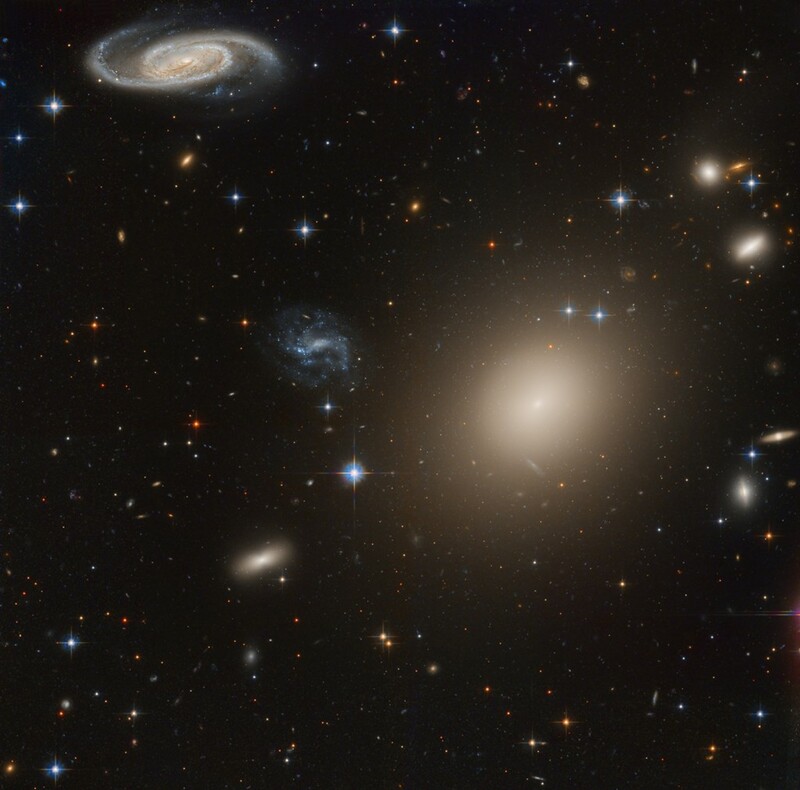 The giant elliptical galaxy (right of center) spans over 100,000 light years and contains about 100 billion stars, comparable in size to our own spiral Milky Way galaxy. The Hubble data can reveal a wealth of detail in even these distant galaxies, including arms and dust lanes, star clusters, ring structures, and gravitational lensing arcs. Named for a cosmic cloud hunter, Australian astronomer Colin Stanley Gum (1924-1960), The Gum Nebula is so large and close it is actually hard to see. In fact, we are only about 450 light-years from the front edge and 1,500 light-years from the back edge of this interstellar expanse of glowing hydrogen gas. 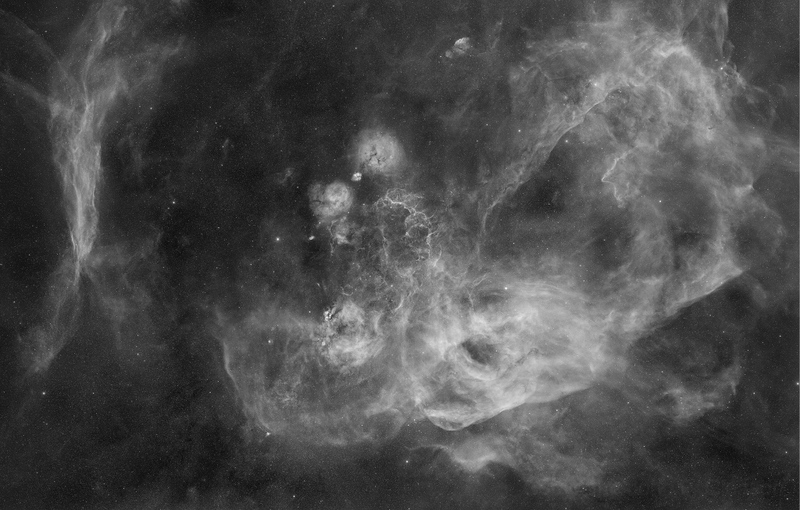 Covered in this 40+ degree-wide monochrome mosaic of Hydrogen-alpha images, the faint emission region stands out against the background of Milky Way stars. The complex nebula is thought to be a supernova remnant over a million years old, sprawling across the Ship’s southern constellations Vela and Puppis. This spectacular wide field view also explores many objects embedded in The Gum Nebula, including the younger Vela supernova remnant.